Order The Lightning Thief here! Learn More About Rick Riordan Here! This first installment of Rick Riordan's best-selling series is a non-stop thrill-ride and a classic of mythic proportions." (Summary and Cover Image from Goodreads + Amazon). (Yes, I used this cover because I actually do have a first edition). Before I continue on with my review, I would like to make a note that this series is intended for Middle Grade audiences. Even though I am not in the Middle Grade audience myself, I still believe it is important for me to share my review on this book. Now, because I am not in the Middle Grade audience, I may have different praises and criticism surrounding this story, and my review may be different than other reviewers/bloggers because of my age/experience with this series. I started reading the Percy Jackson series when I was in middle school - I believe I was in Eighth Grade - after I was recommended the series by one of my best friends. The series had a very interesting plot line to me, and, at the time, I had never read anything like it before, so I decided to give it a try. At this point in time, I was not writing my book reviews nor keeping any good notes about what I enjoyed with the series and what I didn't like. The one thing I did have was a Goodreads profile, along with this book added to my "read" list. If you know me, you know that I don't typically review books that are three stars or below for me. If I give a book three stars, it means I didn't enjoy it as much as I thought I would or the book was not for me. If I rate a book three stars, it doesn't mean that I hate it, it just means that something was off. But, reading through this book a second time, that rating holds no truth to me. Honestly, I can't remember what made me rate the first book in the series as three stars. I think I was just a really tough reviewer and couldn't wrap my head around the premise of the book at the time. I'm really happy I decided to read it again, because my thoughts have changed so much, and for the better. My thoughts about the premise didn't change. I remember picking up the book for the first time, enchanted by the possibility that, yes, Greek Gods can (and do) exist in this world, and they have several, several ties to events in history. I thought that this premise was so interesting and so unique, I couldn't pass it up. I feel like the premise was part of the reason why I gave it a second chance. I keep seeing fellow book bloggers speaking about it (and with the 10 year anniversary of The Lightning Thief being this year, now is a better time than ever! ), and I just have not encountered a book that is anywhere close to it. The way that Mr. Riordan tackles Greek Mythology is unlike anything I have ever seen. Another thing I really enjoyed about this book was the diversity in the characters. My heart goes to Percy, in all honesty, but I love Annabeth and Grover (and I even know the person who plays Grover in the movie!). Every single character I met has unique qualities to them - Percy is obviously confused about his heritage and just wants to be a kid. Annabeth is the bookworm, knowledge-junkie and lover of learning. Grover is the kind soul who just wants to protect everyone and would never hurt a fly. But these characters also share large similarities. The trio just wants to feel like they are loved, and have a home. Annabeth and Percy both struggle with dyslexia, and Grover has his own challenges regarding his mobility and *spoiler* blending in with the mortal world. *end spoiler* These characters are so different from one another, and are so the same, that it is physically and mentally impossible to not love each and every one of them. I also really liked the plot of this book. Note: This is the section where it could get spoiler-y, so this becomes read-on-your-own-risk until I say it is over! (which, will be the next paragraph). While there were definitely moments that were predictable - Percy being a child of a major god, the flying shoes he received suddenly working against them, Aunty Em (somewhat) and (some of) the Oracle's prophecies, I really, really enjoyed it. *end spoiler* I'm also going to say that while the plot did have some predictability, it was probably more for me than a first time reader, because I have read the book before! I obviously still have some memories about the plot, and I think they could come back in a "Deja vu" kind of feeling. I also loved the route of the story. The Lightning Thief starts out with a boy that, really does not believe that he is anything special. Percy gets into trouble often, is forced to move schools a lot, and he doesn't understand why his mother had to marry the worst man on the planet. His home life isn't the best, he doesn't really have any friends, and he doesn't know if he will ever find a place in the world where he fits in. But, throughout the story, Percy realizes that it is none of this that defines him. He is not his terrible step-father. He is not his dyslexia and ADD. He did not ask for any of this. Not only does Percy realize this through the story, that he himself is not responsible for any of the bad things that happened to him. But, throughout the story, Percy (and the other campers) realize that they are special, each in their own ways. They are special because they can get through the bad things in life, they can fight whatever terrible circumstances that life put them in. But, The Lightning Thief in particular also shows the trio working together to reach this view - that they can be anything and do anything that they put their mind to. I would definitely recommend this book to anyone that has not read it. Even if you are an adult, or even if you are still Middle Grade, this story is a great one to read. 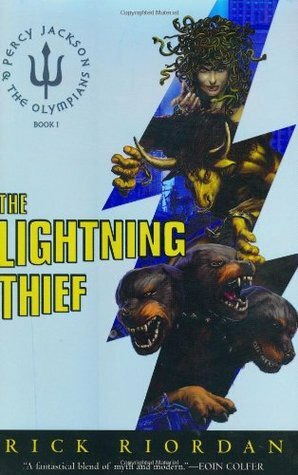 Riordan makes the plot and characters interesting by focusing on Greek Mythology, but that is not the only reason you should read this book. The Lightning Thief has a really great message to it - one that everyone needs to hear. And, who knows? You might be a half-blood too.